Key difference is that you can enjoy the full game for free. This is through the Plex system. Players can buy Plex from the Eve Store and use it to buy a 31 days of gameplay or sell it in game for ISK (gold in Eve). Hence, a player that is able to earn enough ISK can play for free by purchasing Plex in game to convert into 31 days gameplay. This, therefore, allows us to play with several accounts – and each account can be logged in at the same time. A second major difference is that EVE is PVP. There is a large area that is reasonably safe called Hi-Sec (short for high security space) where the guards can take on anyone – they just may not be able to save you in time! The good news is that with very little experience and reading around you can take measures to protect yourself from being ambushed in Hi-Sec. In effect, Hi-Sec is PVE – except when it is not! A third major difference is that everyone is on the one server. Which probably explains why the economy blogging environment is not as developed as World of Warcraft. 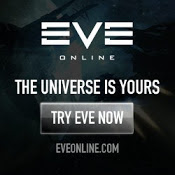 There are about 32 business related blogs for Eve Online. For a long time there were no economy podcasts either - we now have two youtube casts dealing with the economy. As soon as a trading strategy is known it will be copied, so players tend to keep such knowledge to themselves. A fourth major difference is that location means something. An item posted for sale in one region will not be available to buy in other regions. It needs to be transported. This has allowed several trade hubs to be formed in Hi-Sec (much like the major cities in World of Warcraft). The economy is almost entirely player based – starting from mining (farming for ore / herbs in World of Warcraft) through to manufacturing, inventing and trading. All the ships are made by players – except for the starter ships. All the ammunition, fittings, etc. Players can build structures in space for manufacturing etc. There are NPC sellers but they are the minority. ISK comes into the game from PVE – missions, NPC bounties and mob killing. Which then leads onto the other key difference – the economy in Eve is much deeper and complex. Further more, with one server which is seeing a growing player base then items meant for newer players are still in demand. Corporations are probably more important in Eve. For those that like to play the economy there are Industrial corporations, Mining Corporations, Science Corporations though i have not yet found any Trading corporations. Furthermore, all the large PVP corporations have their industrial arms to keep them supplied. Nothing hits home for a new player than being in a mining group sitting in an asteroid field of many mining ships with the capital ships around you gathering the ore you mine. Characters can learn any and all skills. Skill training takes place offline (time based) and a character can learn a little of all skills or go more deeply into a few. Much like World of Warcraft, the game is what you make of it though you may not be entirely able to avoid other players. For new players, the learning curve in Eve is very very steep!